This recipe had me running from the kitchen in tears. Red onions anyone? I am not a voracious meat eater, so when there is an opportunity to replace meat in a recipe, I get excited. This recipe comes from the Giant Book of Tofu Cooking and yields 3 dozen nachos. Grab your baking sheet, and let's get heart healthy and happy! 1. Chop the onions and mince the garlic cloves. Normally, I use my onion chopper, but it is missing in action. 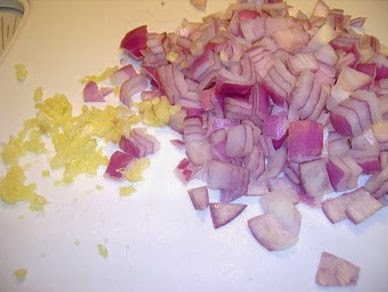 Fortunately, Ehow understands and tells me onion chopping is a daunting task for the uninitiated. I manage to overcome my stark fear of knives and chop this onion. Red is my choice for this recipe because red onions are milder and sweeter than white onions. I do manage to find and use a garlic press to mince the garlic cloves. For those of you who prefer to do it the Martha Stewart way, Ehow can help you out. Just remember peeling garlic and mincing by hand takes time, and you will need a strong constitution to withstand the odor. 2. 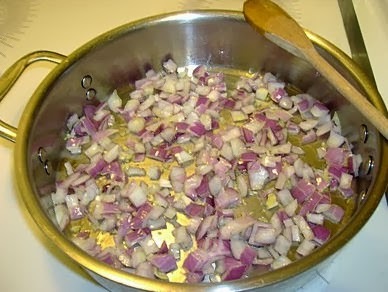 In a large saucepan, saute the onion and garlic in oil until the onion becomes translucent. I use a nonstick Calaphalon skillet for this task. As advertised, food doesn't stick to this pan and clean up takes mere minutes. 3. 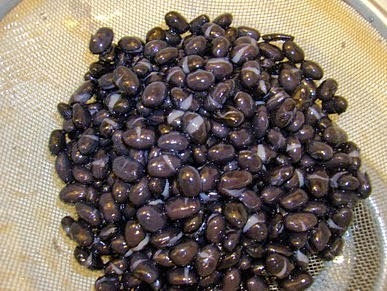 Rinse and drain the black beans. 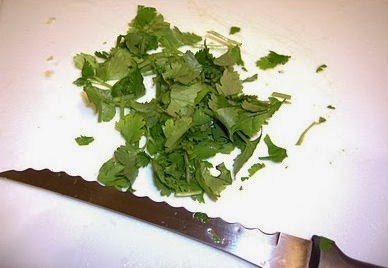 Again with the scary knife, I chop the cilantro. 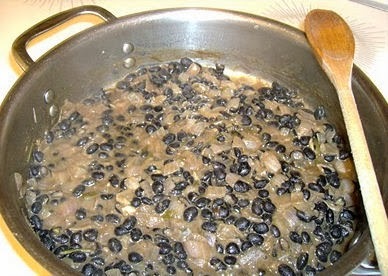 Next, add the black beans and water to the saucepan and bring to a boil. Cilantro, cumin, and chili powder also go in at this juncture. 4. 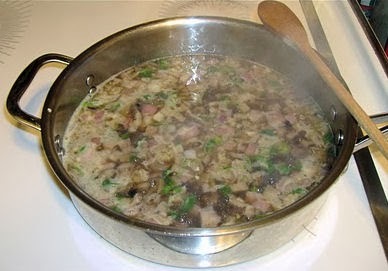 The recipe says to reduce the heat and simmer, covered, until the liquid is thick. I have time to watch a full- length feature film while this concoction is simmering. I suggest adding one cup of water instead of two. If you choose to modify the recipe, keep a watchful eye out for unexpected results. After the mixture has thickened, remove from heat. 5. 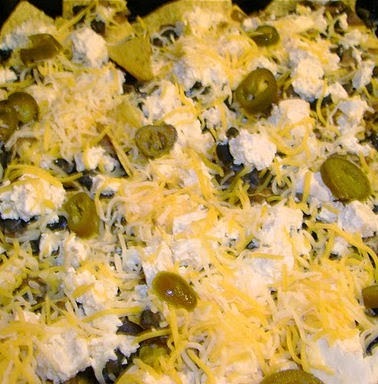 Arrange a layer of tortilla chips on a baking sheet. The instructions state that two baking sheets are needed. They are not. Spoon the entire black bean mixture over the chips, making sure that each chip is covered. To keep this recipe healthy, a good choice of chips is the Guiltless Gourmet brand. They are organic and offer a wide variety of flavors such as yellow corn, blue corn, black bean, and chili lime. 6. Sprinkle the crumbled tofu over the chips and black bean mixture. Top with jalapenos and cheese. I do not grate my own cheese. I can't look at the sharp edges of a grater without getting lightheaded and breaking out in a cold sweat. Instead, I use Sargento's shredded reduced fat 4 Cheese Mexican. 7. 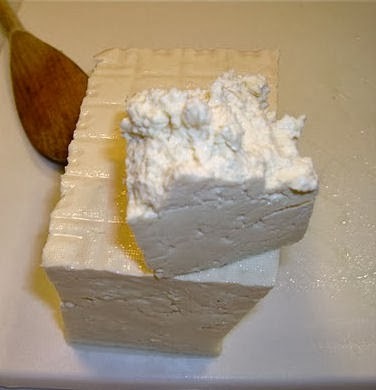 Bake at 350° F for 15 minutes, or until the cheese melts, and then serve immediately. I top mine off with salsa. 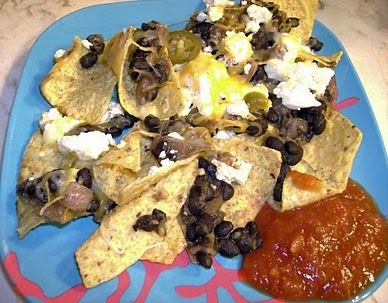 Low fat sour cream or plain yogurt can also be used to wake up your sleepy nachos. Although, in trying to follow this recipe to a T, a few glitches popped up, the end result was spectacular, and I had a nice guiltless evening of nachos and unsweet tea. Additionally, my heart feels happy and healthy.